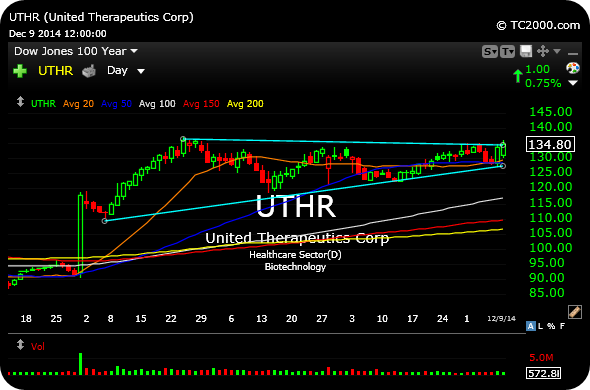 If the broad market follows-through higher or acts constructively after Tuesday's upside reversal, then MIDD UTHR are two actionable long trading ideas on further strength. 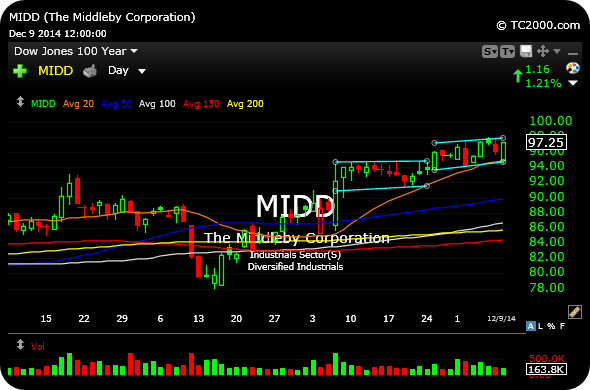 On their respective daily charts, below, note the orderly price consolidations within the context of overall uptrends. Another push towards recent highs makes the threat of a fresh breakout colorable. Typically, it is best to keep a protective stop-loss on the underside of the highlighted (light blue lines) consolidations, in the event the setup fails and breaks down. And on the short side, I would look at shorting Japan's ETF, EWJ, as well as going long the Yen via FXY to play for some mean reversion in the Land of the Rising Sun.